November 13, 2018 | Filed under: Current Articles,Featured | Posted by: Alex A. It seems as if trends in the Western Pleasure pen come and go faster than the seasons change. Typically, the winners set the trends, whether it’s what they wear or how their horses move down the rail. In the past, some trendsetters have greatly impacted the gait of other hopefuls in a negative way, causing horses to be trained to move unnaturally. They looked like they were trying to achieve an ideal that they were never built to attain. But with today’s market being much more saturated with quality movers – plus trainers, breeders, and exhibitors that are increasingly more educated – trends are shifting. We spoke with three experienced Western Pleasure trainers – Gil Galyean, Rusty Green, and Aaron Moses – to weigh in on some trends, both past and present, and predict what they expect to see in the future. 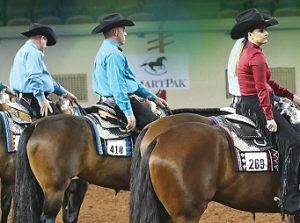 When you combine their time training Western Pleasure horses, they boast upwards of 70 years total experience. When Green began his career in the industry, 35 years ago, he remembers Western Pleasure horses going around the pen looking intimidated. He remembered trying to mimic the very few horses at that time that could jog and lope with natural collection and stride. There just weren’t many that could do it well. When Galyean began, over 25 years ago, he remembers horses being shown shorter-strided and ridden with more contact. As for Moses, the first horse he showed in the Western Pleasure arena was such a poor mover that he demoted her to being solely a Showmanship horse. They’re pretty impressed with what they’re seeing now, noting that it’s a combination of breeding quality, excellent movers in the show pen, and educating those within the Western Pleasure world to keep moving in a positive direction. Green begins by commending breeders in the industry. “We’ve gotten to a point now where really pretty, natural movement is bred into Western Pleasure horses. They make it look easy and natural. They’re very athletic. Overall, they just look like horses you want to ride. That hasn’t always been the case,” Green says. He recalls, early on in his career when there were just a few nice movers for breeding options. Now, there are many more choices for quality sires.